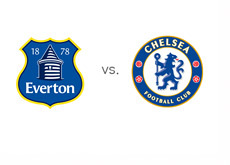 One of the most anticipated matches this weekend is a game between Everton and Chelsea in the English Premier League, taking part on Saturday, September 14th, 2013 at Goodison Park. Everton drew their opening three matches vs. Norwich (A) 2-2, West Brom (H) 0-0 and Cardiff (A) 0-0, while Chelsea won vs. Hull (H) 2-0 and Aston Villa (H) 2-1 before they drew vs. last year's champions, Manchester United, 0-0 at Old Trafford. Everton signed Gareth Barry on loan from Manchester City to fill up the gap left by Marouane Fellaini who left for Manchester United. Barry is looking to start the game on Saturday. Chelsea have added Samuel Eto and Willian from Anzhi this summer and it will be interesting to see if they will get playing time vs. Everton. Jose Mourinho's side are the favourites to win this weekend. A £100 bet on Chelsea could yield £135 in profit, while the same bet on the hosts could yield £240 in profit. The most likely scoreline on Saturday, according to the odds is a 1-1 draw, offered at 5/1. Samuel Eto is the favourite to score for Chelsea at 6/4 (bet £100 for a chance to win £150), while Arouna Kone is the favourite to score for Everton at 11/5 (bet £100 for a chance to win £220). They way Chelsea played their last game vs. Manchester United indicates that they will be playing very tight D this season. When Chelsea won the English Premier League in 2004/05 season, under Jose Mourinho, the team conceded only 15 goals, the fewest in the league's history. Should be a good game!